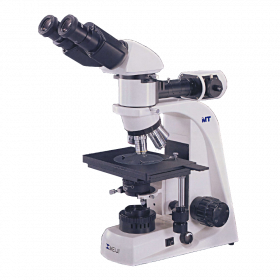 The Omano OMM300 inverted, metallurgical microscope provides superb optics, built-in polarization capabilities, color filters and a host of other thoughtful details. 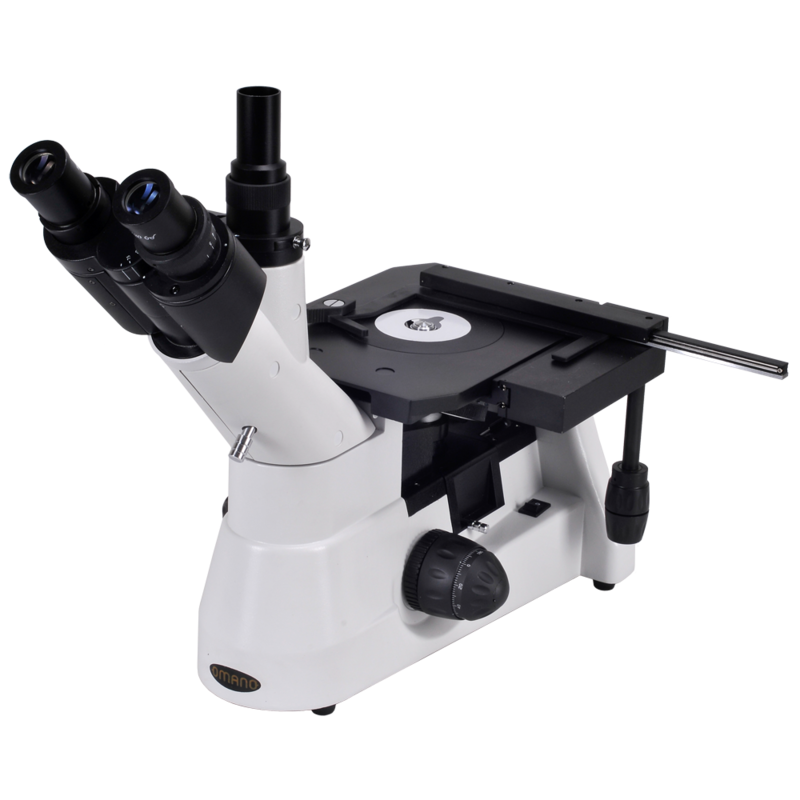 It features five plan objectives (4x, 10x, 20x, 40x, 63x) and epi-Kohler lighting with three included WF10X eyepieces. One eyepiece includes a cross-hair linear reticle. It also includes a 23mm trinocular adapter for an eyepiece camera. Lifetime Limited Warranty. The heart of the OMM300-T optical system includes five plan, parfocal objective lenses (4x, 10x, 20x, 40x, 63x) set in a quintuple nosepiece. 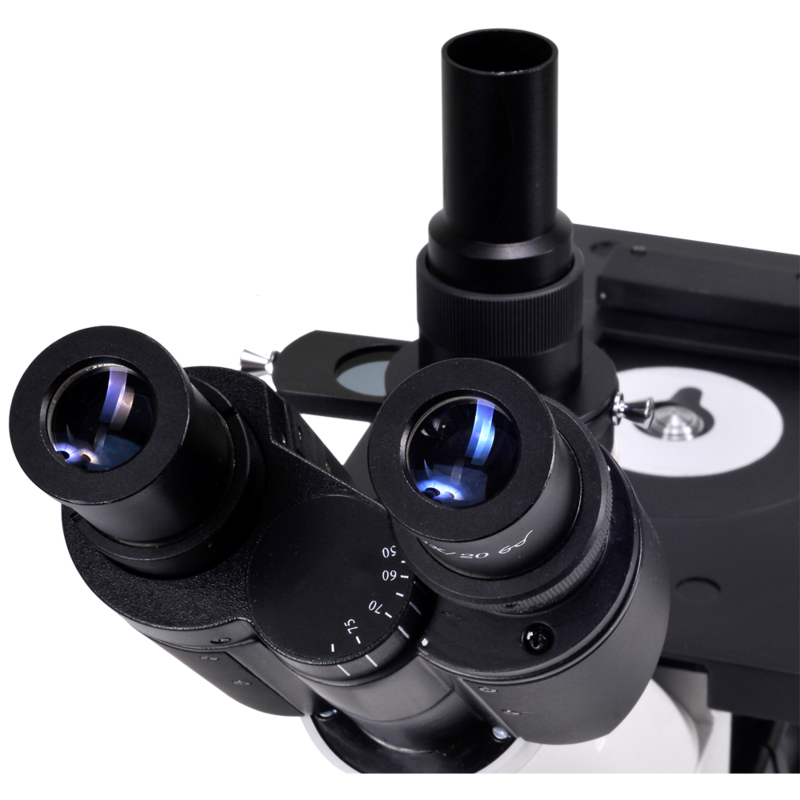 There are three WF10x eyepieces, one of which includes a crosshair, linear reticle for measuring applications. Magnification ranges up to 630x. 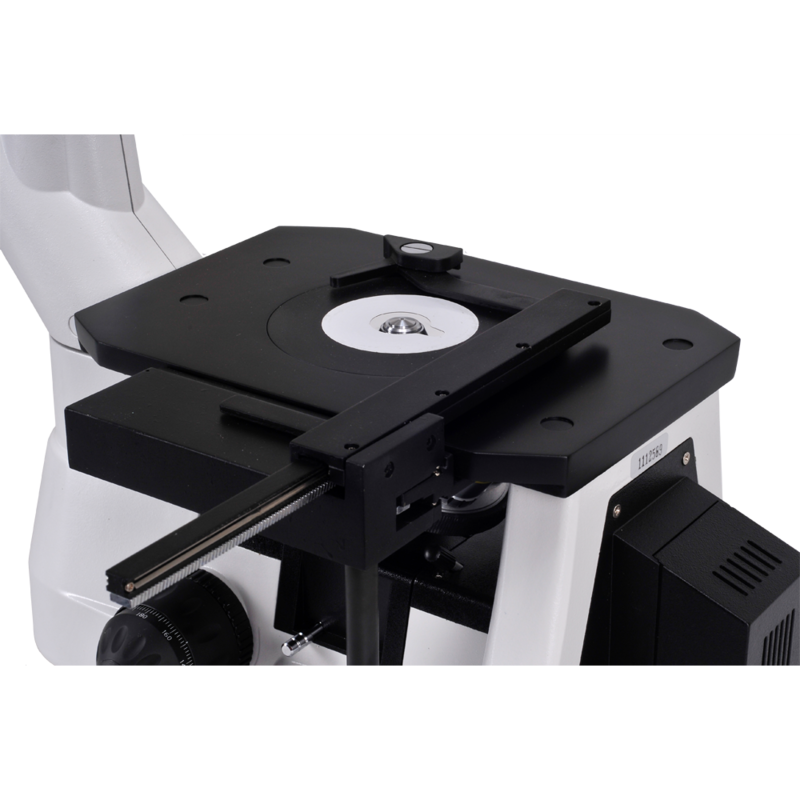 The polarizing disk is slide in/out with a fully rotatable analyzer and 360 degree rotatable color filters ( brightfield, yellow, green, blue). 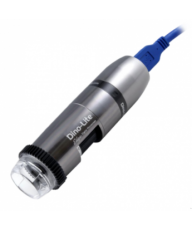 The trinocular port can be used for photomicrography at the same time as the eyepieces. The XY microscope stage is excellent. It is large, solid and can handle unlimited size specimens. The stage measures 242mm x 172mm with a moving range of 75mm x 50mm. For added versatility, the stage can be used in two configurations - with or without the central mechanical stage. In addition, the stage includes a thoughtful addition in the form of a standard slide/petri dish rack. This rack enables viewing of 22mm diameter petri dishes and standard 1" x 3" inch slides. Rack and pinion focusing includes ergonomic, coaxial coarse/fine movement to within .002mm graduations. The condenser illumination is powered by 12V 30W Epi-Kohler halogen with aperture iris diaphragm, field iris diaphragm and variable controls. 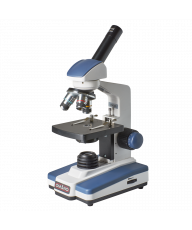 The voltage is universal (85V-230V) so the microscope can be used worldwide. 23mm trinocular camera adapter, rubber eyecups, stage plate, calibration slide, Manual, dust cover, fuse, bulb. Shipping Wt. and dimensions: 26 Lb. 30"x19"x12". 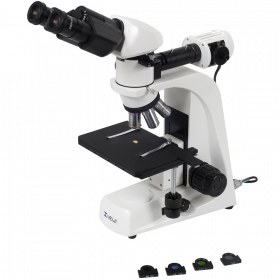 The Omano OMM300 inverted, metallurgical microscope provides superb optics, built-in polarization capabilities, color filters and a host of other thoughtful details. 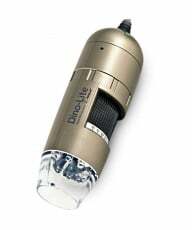 It features five plan objectives (4x, 10x, 20x, 40x, 63x) and epi-Kohler lighting with three included WF10X eyepieces. One eyepiece includes a cross-hair linear reticle. It also includes a 23mm trinocular adapter for an eyepiece camera. Lifetime Limited Warranty.OpticsThe heart of the OMM300-T optical system includes five plan, parfocal objective lenses (4x, 10x, 20x, 40x, 63x) set in a quintuple nosepiece. 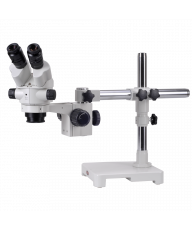 There are three WF10x eyepieces, one of which includes a crosshair, linear reticle for measuring applications. Magnification ranges up to 630x. The polarizing disk is slide in/out with a fully rotatable analyzer and 360 degree rotatable color filters ( brightfield, yellow, green, blue). 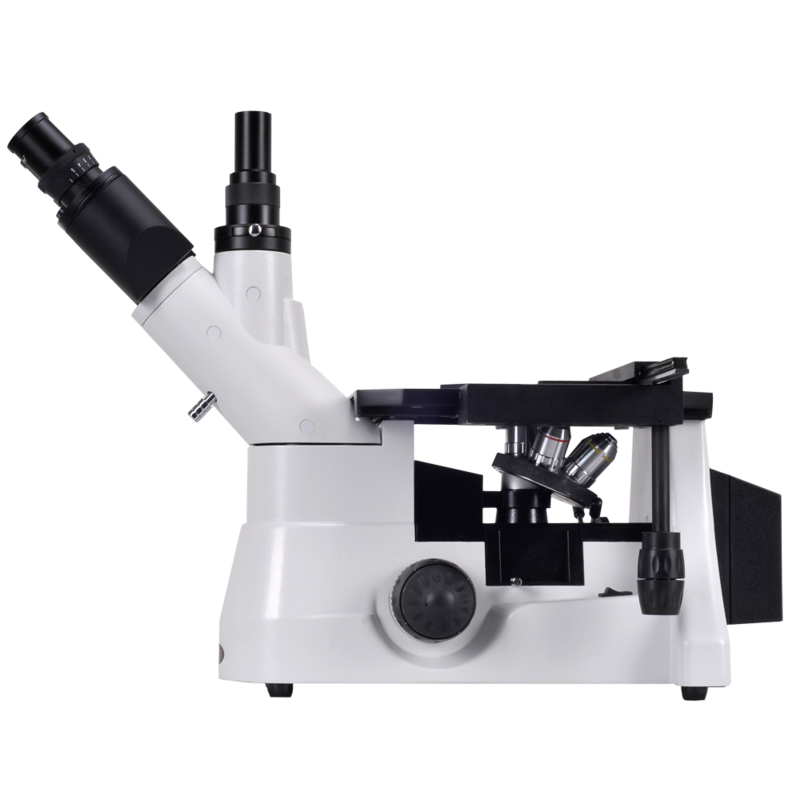 The trinocular port can be used for photomicrography at the same time as the eyepieces.Stage & FocusThe XY microscope stage is excellent. It is large, solid and can handle unlimited size specimens. The stage measures 242mm x 172mm with a moving range of 75mm x 50mm. For added versatility, the stage can be used in two configurations - with or without the central mechanical stage. In addition, the stage includes a thoughtful addition in the form of a standard slide/petri dish rack. This rack enables viewing of 22mm diameter petri dishes and standard 1" x 3" inch slides. Rack and pinion focusing includes ergonomic, coaxial coarse/fine movement to within .002mm graduations.Condenser & illumination The condenser illumination is powered by 12V 30W Epi-Kohler halogen with aperture iris diaphragm, field iris diaphragm and variable controls. 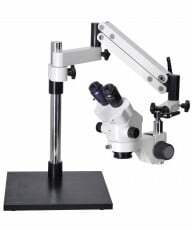 The voltage is universal (85V-230V) so the microscope can be used worldwide. Accessories23mm trinocular camera adapter, rubber eyecups, stage plate, calibration slide, Manual, dust cover, fuse, bulb. Wt. and dimensions: 26 Lb. 30"x19"x12".